Earlier this month, actor Chris Pratt announced that he was engaged to Katherine Schwarzenegger. For those unaware of her lineage, Katherine is the daughter of actor Arnold Schwarzenegger and Maria Shriver. Shriver’s mother, Eunice, was the sister of John, Robert, and Ted Kennedy. In other words, Katherine is a descendant of one of America’s most famed political dynasties. The prospect of an another Kennedy wedding—and potentially one within the public eye, thanks to Pratt’s own fame—is more than a little bit intriguing. After all, Kennedy brides have helped establish some of the most iconic moments in modern wedding history. But beyond Jacqueline Bouvier and Carolyn Bessette, there have been many more brides within this fabled American family worthy of recollection. Below, we discuss the ten most famous Kennedy brides and weddings throughout history. In 1914, Joseph P. Kennedy married Rose Fitzgerald. Rose, whose maiden name should be familiar thanks to her son and future president John F. Kennedy, went onto become the family matriarch. But on the day of her wedding, her own father, Boston mayor John F. Fitzgerald, apparently had doubts about the union—and about his future son-in-law in particular. (Perhaps this had something to do with the fact that Joseph’s father was one of John’s former political rivals.) Regardless, Mayor Fitzgerald had gone so far as to send his daughter Rose to a European nunnery in an attempt to diffuse the romance. (The stint ultimately only lasted two years.) In the end, once Rose had returned stateside, Joseph proposed with a two-carat diamond, and John F. Fitzgerald walked his daughter down the aisle. Kathleen Kennedy’s romance, and life, were both cut tragically short. The second daughter of Joseph and Rose Kennedy, she married William Cavendish, Marquess of Hartington, in 1944. They met while Kathleen spent many of her formative years in pre-war Britain, thanks to her father’s work as the American ambassador. Since Rose Kennedy did not approve of the union, due to the Marquess’ Anglican faith, Kathleen married Hartington in a civil ceremony with only her brother Joseph there to represent her family. The bride wore a short white dress and complementary hat with a netted veil for the occasion. A few short months later, Cavendish was killed while serving in the war. As for Kennedy, she died a few years later in a plane crash when she was only 28 years old. Robert F. Kennedy proposed to Ethel Shakel in early 1950. During the summer of that year, when the bride was twenty-two years old, the couple were wed. The Catholic ceremony took place in Greenwich, Connecticut, where the bride grew up. Mamie Conti, a then-prominent fashion designer based in New York City, designed the bride’s floor-length gown. Ethel paired her dress with a single strand of pearls to walk down the aisle at St. Mary’s Church. In 1953, Eunice Kennedy (Kathleen Schwarzenegger’s grandmother) married Sargent Shriver at New York’s famed Saint Patrick’s Cathedral. The wedding gown worn by Eunice—Joseph and Rose’s fifth and middle child—would fit in well at any bridal fashion presentation today. But the portrait-necked dress, which is most remarkable for its alternating white bands, seemed to almost mirror the couple’s wedding cake. Topping off at six layers, the bride had to climb up onto a chair (assisted by the groom) to attempt to cut a mid-level piece. Her husband went on to help establish the Peace Corps and serve as U.S. Ambassador to France, while Eunice, a Stanford alumna, is remembered for her role in helping to found the Special Olympics. On September 12, 1953, Jacqueline Bouvier married John F. Kennedy. After the Archbishop of Boston led the church wedding, which concluded with an onslaught of well-wishers cheering the couple as they exited the chapel, the wedding party and its guests headed to a farm owned by the bride’s mother and stepfather in Newport, Rhode Island for the reception. The bride (as well as her bridesmaids) wore dresses designed by Ann Lowe. Lowe, a New York-based designer who specialized in garments for members of the highest echelons of societies, was a pioneering African-American fashion designer. However, the full-skirted gown, which was appointed with doily-like decorations on the skirt, and a portrait neckline, was apparently not well liked by the bride. Even more interesting is that the dress, as well as those of her bridesmaids, was destroyed in a flood at Lowe’s studio in the lead-up to the wedding. Lowe and her team managed to remake all the required gowns in time. While Lowe’s studio incurred a great loss in profit for the accident at the time, the wedding dress has helped secure the designer’s place in fashion history. 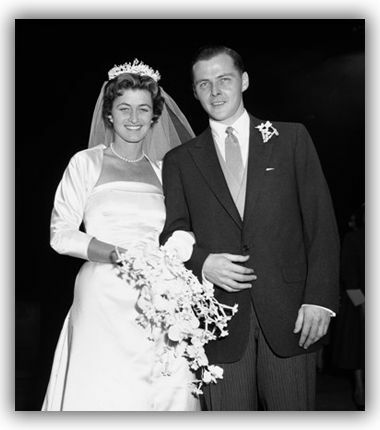 Patricia Kennedy, the sixth of Joseph and Rose’s children, married in a white satin gown and cathedral-length veil in the spring of 1954. The bride was just shy of her thirtieth birthday when she said “I do” after a brief engagement to actor Peter Lawford. Lawford, who appeared in movies such as the original Ocean’s 11 and Little Women, shared Pat’s passion for films. After marrying at St. Thomas More, a Catholic church in New York City, the couple settled in Santa Monica. The marriage later ended in divorce. Jean Kennedy was the youngest Kennedy daughter. In 1956, the future U.S. Ambassador to Ireland married Stephen Smith in a Catholic ceremony at New York’s Saint Patrick’s Cathedral. Her dress appeared to be nearly identical to the one worn by her older sister Patricia, but Jean topped her own long veil with a sparkling tiara. The bride’s cascading bouquet featured white orchids—among other flowers. In August 1986, Maria Shriver, daughter of Eunice and Sargent Shriver, married Arnold Schwarzenegger. The bride’s cousin Caroline Kennedy served as her maid of honor. At Shriver’s wedding ceremony at St. Francis Xavier Church, 500 guests were in attendance and later a reception was held at their family compound in Hyannis Port. Schwarzenegger, who was already a global superstar after the premiere of the 1984 movie The Terminator, asked former Mr. Universe Franco Columbu to be his best man. The bride’s lace dress featured a deep V-neck and puffed-up shoulders, while her neck was framed by a matching lace choker. In 1986, Caroline Kennedy, daughter of John and Jackie, married author and artist Edwin Schlossberg. While the family attempted to keep the wedding private, thousands of well-wishers cheered from outside the church. Edward “Ted” Kennedy, John F. Kennedy’s younger brother, walked his niece down the aisle. The bride’s brother, John F. Kennedy Jr., served as best man, while her cousin Maria Shriver was matron of honor. The bride’s gown was the first wedding gown ever designed by Carolina Herrera. And despite its somewhat 1980s silhouette, its small, shamrock appliqué continues to appear in the designer’s bridal work. The mother of the bride wore a pale green ensemble to the event. The singer Carly Simon was notably late to the ceremony, while a fireworks show arranged by George Plimpton capped off the Hyannis Port reception. Carolyn Bessette’s wedding dress has gone on to become of the most iconic gowns in bridal history. Designed by then-little known designer Narciso Rodriguez, it captured the zeitgeist of 1990s minimalism, and the seismic shift that was taking place within the wedding dress industry. The ceremony itself was kept very private, thanks in large part to the fact that it took place on the secluded Cumberland Island, located off the coast of Georgia. Tragically, the couple later died in a private plane crash while on their way to another Kennedy wedding, that of Rory Kennedy, the youngest daughter of Robert and Ethel.